Made popular as Tetherberry in the Blackberry community, Tether Beta has been released on Android as a tethering option with some reputation. The open beta probably won’t be open for long, so now is the time to check it out before the full/paid version hits the market. No idea on what that price will be once that happens, but this beta is free…for now. 1. Download and install the Tether PC software. We strongly recommend if you were using TetherBerry or a previous version of Tether to uninstall before installing this version. 2. On your Android phone go to Settings->Applications->Development and check USB debugging. Then run the file. It may ask you for permission to run software from outside of the Android Marketplace, make sure to give it permission. 4. Run Tether on the PC and select Android, then USB for the connection method. 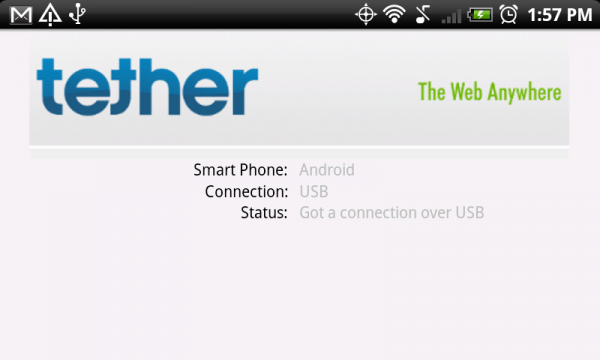 Then connect your Android to the computer with a USB cable and run Tether on your Android. The two should establish a connection and you should see data being sent and received on your PC. Took me about 5 minutes to setup and start tethering on my Incredible. Check it!